Simply put, a hydrotechnical engineer’s job is all just water under the bridge. British Columbia rivers are dynamic and powerful systems that move large amounts of water, sediment, woody debris and ice from our mountain tops all the way to the ocean. Along this journey, the waters encounter provincial highways and roads, and that’s where we come into the picture. We asked Hydrotechnical Engineer Dan Cossette about how he and his colleagues work to keep bridges, culverts and highways clear of moving water. What do hydrotechnical engineers do? A big part of hydrotechnical work is determining how wide and how high a bridge must be to safely span a waterway, as well as how to protect our bridges from the mighty forces of the river. We study the river where we want a highway to cross and determine how much water it will carry during a flood (we call this hydrology). We then collect survey data to map out the ground and channel surface and use it to build a computer model, which helps us determine how high the water will rise and how fast it will move (known as channel hydraulics). 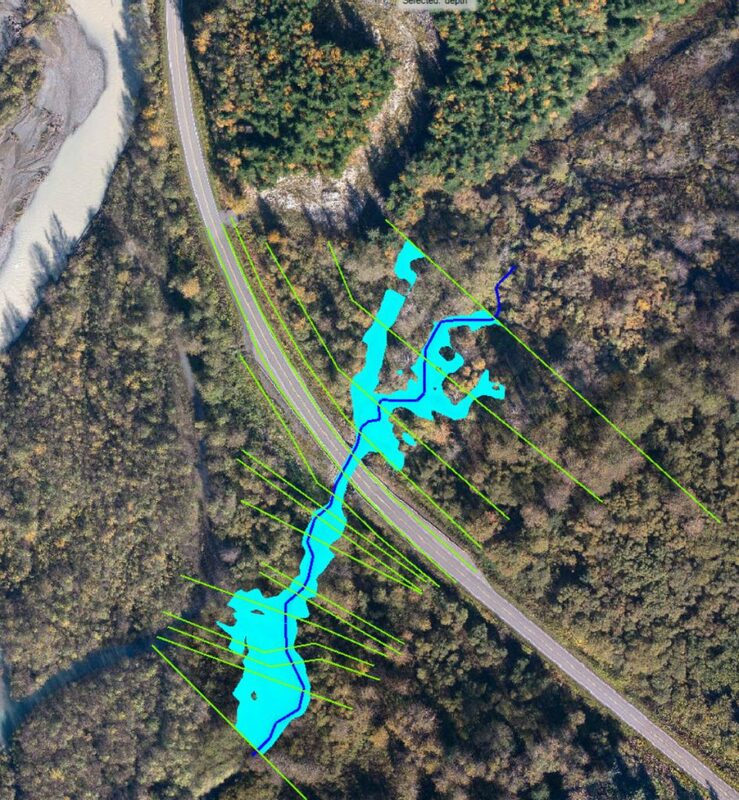 A hydraulic model for a bridge near Stewart using aerial imagery. The light blue shows the water’s surface extent and the bright green lines show the location of channel cross sections used to calculate the height of the water surface. 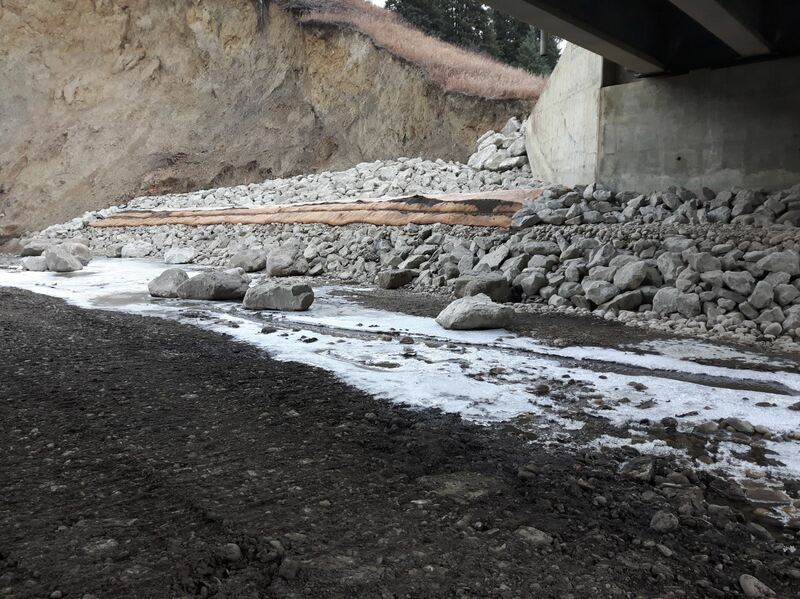 Fast-moving water can remove and transport riverbank rock, soil and vegetation – erosion which can cause a river to change course and threaten our highways. Fast-moving water may also interact with our bridge structures, causing strong currents that can deepen the riverbed and threaten the bridge foundations. The term we use is “scour”. 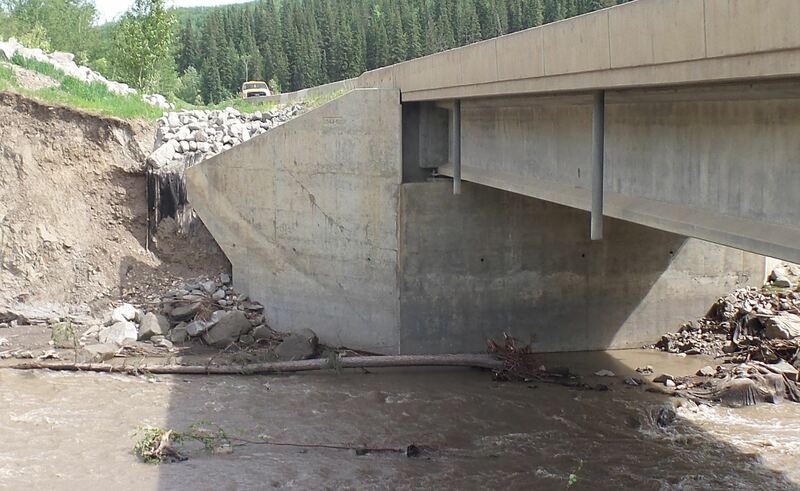 Using information from our analysis, we design countermeasures to protect bridges against erosion and scour. One common tactic is to armour vulnerable areas of the channel banks and bed with rip-rap, large, interlocked rock. BEFORE: Scour and erosion damage at St. John Creek Bridge No. 3, after high water flows. A hydrotechnical engineer is one part of a larger team and to do our job well we need to work closely with structural engineers, geotechnical engineers, highway engineers, environmental professionals, operational staff and others. Why is hydrological work important? Hydrotechnical engineers help maintain a safe highway system for the travelling public while providing a reliable transportation network that supports British Columbia’s and Canada’s economies. Highway flooding and washouts can be major safety hazards and extremely disruptive to businesses, commerce and people’s everyday lives. Hydrotechnical engineers help protect bridges and highways, which are high-dollar value, publicly-owned assets. When the Ministry of Transportation and Infrastructure invests in a bridge, we want to make sure it has a long service life and won’t be washed away in the next big flood. 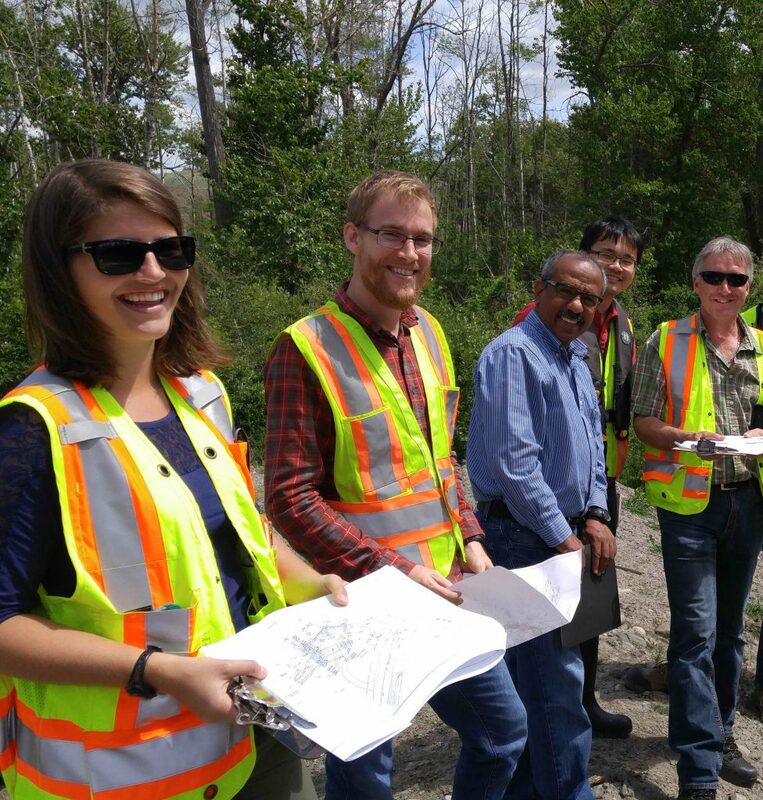 Our hydrotechnical engineering group: Alysha Piccini, Dan Cossette, Khalid Khan, Dickson Chung and Mike Sullivan. What factors are at play when dealing with water and roads/bridges/structures? There are a wide range of factors that need to be considered – many of them site specific – so it’s essential that we complete field investigations to properly understand the situation. For example, in steep channels we often have to consider the potential for landslides or debris flows (masses of trees, branches, dead vegetation, soil, etc.) which can plug our bridges and culverts, causing water to flow elsewhere. We usually see evidence of these kinds of events while inspecting the channel. Another important factor for us to understand is how a changing climate will affect the amount of water a river receives and how that will impact the channel. We use a lot of historic data in our work which lets us see how river systems have behaved in the past. We often need to rely on climate scientists and other specialists to help us determine how they may behave in the future. 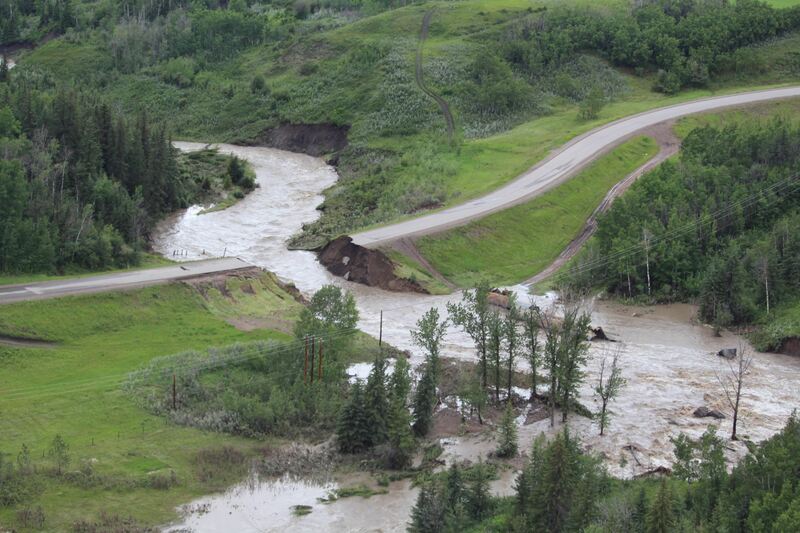 Near Dawson Creek where Rolla Road (and the culverts underneath it) were overwhelmed by extraordinary floodwaters, in 2016. What might your typical day involve? In the winter months, I am typically working on design projects, planning and scoping future projects and reviewing design work provided by our engineering consultants. During flood season, I am usually monitoring river behaviour, and when we have issues, providing support to our operational staff. Flooding tends to occur in the spring when the snow is melting, and during the summer and fall, because of rainstorms. In the summer months, I am busy completing field inspections and construction reviews. What kind of settings do you work in? Hydrotechnical engineers spend a lot of time of time working around rivers. This can mean hiking the channel and terrain around our bridges, wading through large culverts and inspecting damage from flood events. We need to be aware of hazards due to traffic, wildlife, weather and flood conditions as well as the challenges of working in remote locations. We address these hazards by working in pairs, having a communication and check-in plan, wearing protective equipment like personal flotation devices and taking training like swift water rescue. 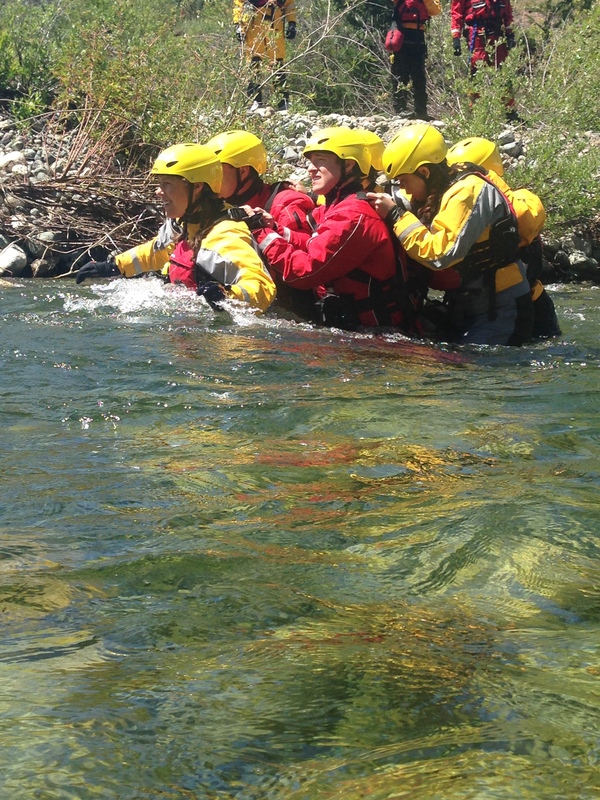 Working as a pack during swift water rescue training. Our work takes us all around the province to some very interesting locations. Over the past couple of years, I have inspected bridges on the very rainy Haida Gwaii, around the Nisga’a lava beds north of Terrace, out in the Fraser River headwaters around McBride, on alluvial fans (gravel, sand and silt formations) in the Pine Pass near Chetwynd, and by Bear Glacier near Stewart. Do you have questions about work done by ministry’s employees? Ask us in the comments section below. but doesn’t that under-the-bridge water flows towards the landsliding areas? i’ve seen it going many times. Hi Chad – we aren’t too sure of your question here? Could you clarify? Are you saying that water goes elsewhere in a potentially damaging way? Is there somewhere specifically you can refer us to? It would help us get the best response for you. Thanks!